Despite seeing an excellent run-up from .0045 to .0074 (+64%) on Thursday as we called OWCP off of its bottom, we mentioned the indicators on the chart that were suggesting that another strong session could be in the cards on Friday. The stock held at an even penny into the close, so we’ll be very interested to see if OWCP can become a multi-day runner and tack on a third straight solid session. We caught PRRE on a routine scan Friday morning after noticing some abnormal activity in the previous session. It was a good catch, because apart from a slow start on the day volume-wise, things really kicked into high gear around lunchtime. After noticing the LE chart giving off a double-bottom signal, in addition to having a chart gap to the upside, and an extreme up-surge in its recent history, we’re interested in tracking a couple of options contracts over the next few weeks. 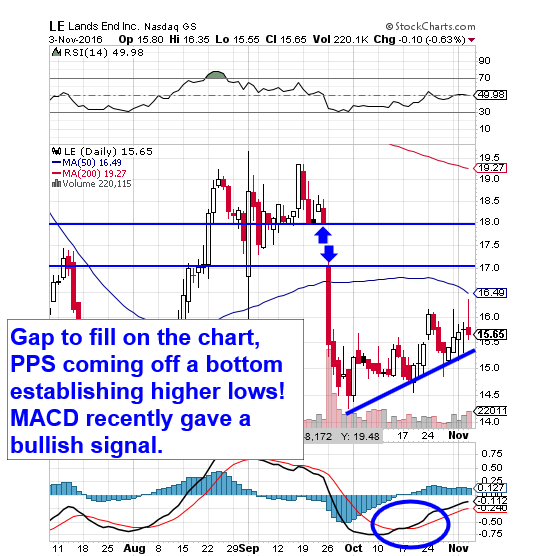 We’re going to watch closely for a reversal, and monitor the LE 10/21 $12.50 and $15 Calls. 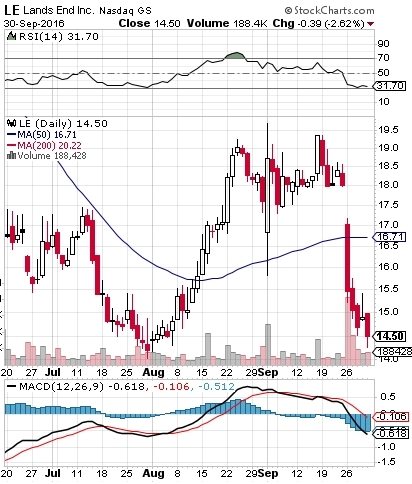 All of the chart factors mentioned above are clearly visible on the snapshot below. Regaining even half of the ground the stock has lost in recent sessions would send these contracts on a ride.